Strongwell is Still Number One! On September 8, 2012, the YMCA of Bristol launched its sixth annual Bristol Health Challenge, intended to encourage participants to create and maintain healthy habits while supporting a community partnership with the United Way of Bristol. This year, 165 total participants from eleven teams lost a collective weight of over 1,060 pounds as a part of the challenge! 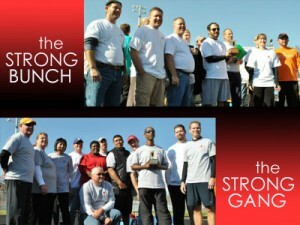 Strongwell would like to recognize and thank its two 2012 Corporate Challenge teams: The Strong Gang and The Strong Bunch. The Strong Gang team placed first in the overall competition and in the categories of weight loss and team workouts, and came in fourth in competitive events. The Strong Bunch team placed second in workouts, fourth in weight loss and fifth in competitive events. This is the fourth consecutive year Strongwell has defended its overall first place trophy. During this year’s competition, Strongwell’s two teams lost over 400 pounds and recorded over 800 hours of workouts! With two teams, this year’s challenge also created friendly competition within the plant on top of the group effort to defend its long-standing title. Strongwell would also like to congratulate the BTES (Bristol Tennessee Essential Services) High Voltage (2nd place) and Megawatts (3rd Place) teams which gave the Strongwell teams a run for their money this year. Strongwell would also like to thank the Bristol Family YMCA for continuing to support the strategic initiatives of the United Way of Bristol.